I love a nice piece of salmon so when I discovered some lurking at the bottom of the freezer yesterday morning, I decided I would try something new with it. I’m not a massive fan of creamy sauces that usually go with salmon so I thought I would see if I could create something saucy but a bit different. I ended up adapting a recipe I found online (here) but changed it quite extensively! The result was this lovely light recipe that doesn’t take too much effort but the results are amazing. The garlicky asparagus really adds something to the dish however if you don’t like/haven’t got asparagus any green veg will do (sugar snap peas, green beans, broccoli). I’ve used wild rice as it’s my new fav however you could do it with any rice you fancied. I have had the rest of the salmon for left overs today and I added a few udon noodles to the salmon pan to soak up a bit of the sauce. This was gorgeous too and would be a good alternative if you didn’t fancy rice. The recipe for the leftover salad is also below ! Pop the soy sauce, red wine, mirin, tabasco (or chilli), brown sugar, grated garlic and 3/4 of the ginger into a pan and cook for around 10 minutes on a high heat, until it reduces by half. Then remove the sauce from the heat and add the rest of the ginger and the juice of half the lime. Take a baking dish, spray the base with some low cal cooking spray and lay the salmon in the dish. You want a baking dish that’s not much bigger than the fish to make sure all the lovely glaze infuses into the salmon. Pour the glaze over the salmon and pop on the oven on 180 degrees Celsius for around 10 minutes. At this point you want to pop your wild rice on as it takes around 20 minutes to cook. After 10 minutes, take your fish out the oven and spoon some of the sauce over the fish. Pop back in the oven for five minutes and then repeat the basting, popping the salmon back in and baste again. All in all the salmon cooks for 20-22 minutes. While the rice and salmon are bubbling away pop your garlic in a frying pan with the butter and cook on a medium heat (don’t have the heat too high as this will burn the garlic, you can also add a little water to ensure it doesn’t burn). Once the butter is melted, throw in your asparagus and fry until cooked to your liking (for me that’s 3-4 minutes as I like it crunchy). 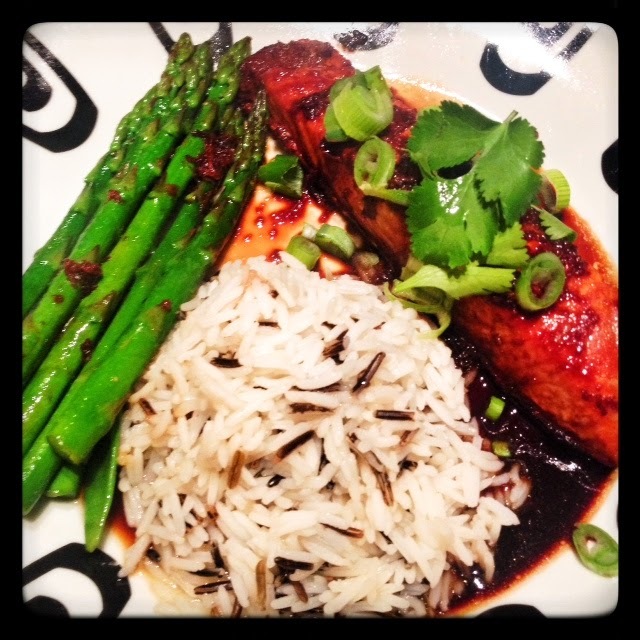 Once everything is cooked, drain your rice and pop on the plate with the salmon and asparagus. Pour the lovely glaze over the salmon and rice and top the salmon with the spring onions. Garnish with a touch of fresh coriander and serve with a little slice of lime! 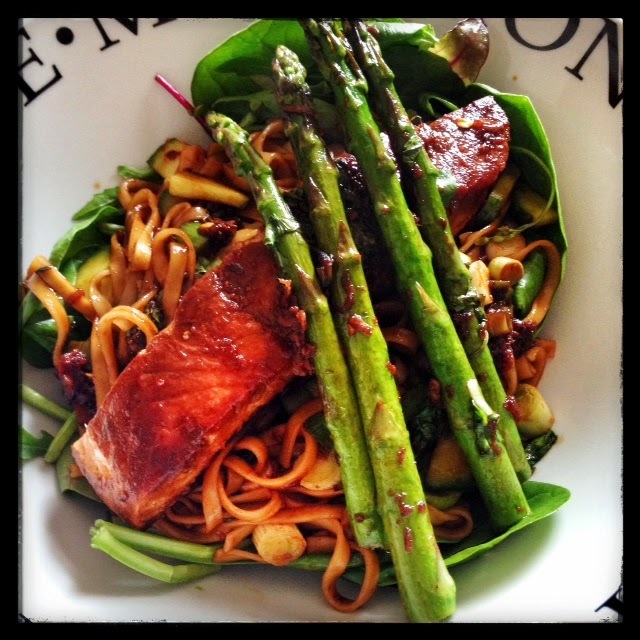 If you do fancy turning your leftovers into a salad, simply pop your udon noodles in some boiling water and the salmon and sauce in a separate frying pan. Once the noodles are cooked (four minutes) pop them into the frying pan and add spring onions, cucumber and some more fresh coriander. Toss the veg together with the noodles and serve the noodles on a bed of salad leaves and spinach. Top with the salmon and a slice of lime! Morrocan Sausage and Chickpea Stew – Only 6sp!